Physical Characteristics - Maximum Recovered I.D. (metric): . 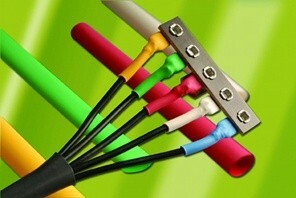 FIT® heat shrink tubing offers a reliable way to protect and seal terminations or add additional mechanical ruggedness. FIT® preferred heat shrink products are made from premium compounds under the tightest manufacturing controls. This means FIT® will consistently have excellent physical characteristics such as low longitudinal shrinkage and wide temperature ranges while providing an elegant appearance when used alone or on OEM equipment. Colors: Black, blue, and clear (clear tubing may exhibit some color tint that is the result of the product's chemistry; the tint is variable and can be any color). AMS-DTL-23053/5 Class 1 (except clear), Class 2 (clear).